Control and Dynamic Systems: Advances in Theory and Applications, Volume 42: Analysis and Control System Techniques for Electric Power Systems, Part 2 of 4 covers the research studies on the significant advances in areas including economic operation of power systems and voltage and power control techniques. 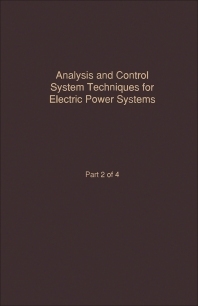 This book is composed of eight chapters and begins with a survey of the application of parallel processing to power system analysis as motivated by the requirement for faster computation. The next chapters deal with the issues of power system protection from a system point of view, the voltage stability phenomenon, and an overview of the techniques used in the reliability evaluation of large electric power systems. These chapters also look into the reliability assessment of bulk power systems, which are the composite of generation and high-voltage transmission, often called composite systems. These topics are followed by investigations of the potential of integer quadratic optimization to improve efficiency in a radial electric distribution system through the coordination of switched capacitors and regulators. Other chapters consider the issues of the optimal operation of a power system that are substantially complicated as a result of the large system scale nature of these issues. The final chapters explore the techniques for achieving requisite speed improvements that are essential to electric power systems and the problems on effective methods in hydro optimization. This book will be of value to electrical engineers, designers, and researchers.